Entries now closed. Judging has begun! Welcome to the ninth annual “Imagination Begins with You…” high school writing contest. Contest Description: Short story, less than 1,000 words. Prizes: First place winner receives $300. Second place winner receives $100. See previous winners and finalist in One Spark. Click here to purchase One Spark now! Criteria: Short stories will be judged on: (a) Creativity/Imagination 50%, (b) Plot 25%, (c) Grammar 25%. Any genre (fiction/non-fiction) is acceptable. For complete rules or to enter visit the “Imagination Begins with You…” contest page. I am pleased to announce the winners of the 2018 “Imagination Begins with You…” eighth annual high school writing contest. 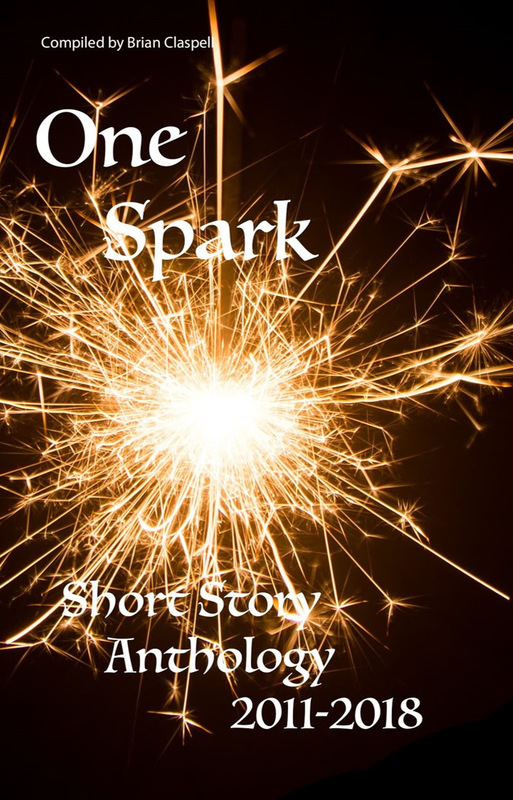 I am also excited to announce that all of the finalists and all previous winning stories are included in a short story collection “One Spark” (listed under Claspell on Amazon in paperback and as an eBook). All profits from the sale of this book will go for scholarships. Join me in congratulating this year’s winners. Also, pick up a copy of “One Spark” to read all of the finalists’ stories and support this contest in the future. Convergence by Brian W. Claspell Available Now! Turns out that Jim Conrad may not be as fictional as the CIA thinks. When a local Chicago accountant is asked to stand in as the fictional eccentric billionaire character with the undercover CIA operative Jenny, he quickly discovers he is being asked to do more than originally thought. Jim and Jenny discover a trail of deceit and corruption that makes Jim question who he can trust among his new employer, friends and acquaintances. The eBook and paperback are available on Amazon. There were around 1,150 entries this year. What a fabulous year. A special thanks to Charity Bradford and Amy Hancock for helping to judge this year. Look up there latest books on amazon. I am pleased to announce the winners of the seventh annual “Imagination Begins with You…” high school writing contest. New Contest coming in June! – Inspired by the many great entries, I will be sponsoring a new contest starting in June. There were many great stories written with a lot of passion that focused on discrimination, suicide, loss of parents or a friend, immigration and more. These challenges are real and your voice should be heard. This contest will provide a forum to share your solutions. Look for the rules (and yes a small prize) at www.coolimagination.com by the end of May. “Convergence” – Who is Jim Conrad? A billionaire or a creation of the CIA? Find out in the new action-thriller written by Brian W. Claspell and coming soon! This year’s “Imagination Begins with You…” high school writing contest has over 350 entries so far from 40 states. Is your state one of them? The still time to enter for the seventh annual “Imagination Begins with You…” high school writing contest. Welcome to the seventh annual “Imagination Begins with You…” high school writing contest. Submission: Use the online contest entry form (preferred). You may also enter using eMail to brian.claspell@gmail.com (no attachments please, include story in the text of the email) or mail to Brian Claspell – 42 Alexander Manor Way – Simpsonville, SC 26980. Include: Name, email address, high school and year in school, word count, and title of story. Open to entries – the 2019 high School writing contest! Available on Amazon – CONVERGENCE! an action-thriller novel. Help the Cause! Buy “One Spark” a collection of short stories from previous high school entry winners and finalist.